The Needlework Retailer. The needlework trade magazine. The only trade magazine devoted entirely to the counted cross stitch, needlepoint, and needlework industry. Search ALL of the web sites listed in the Wholesale Needlework Buyer's Guide in one easy search. We highlight a new product each day on the needlework blog. Email us if you have news you would like included. 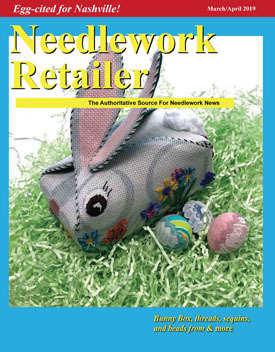 Receive the Needlework Retailer News by email. For advertising information call Megan Chriswisser at 1-800-561-5380. The Needlework Retailer is the only trade magazine devoted entirely to the counted cross stitch, needlepoint, and the needlework industry. Published by Yarn Tree 6 times a year and distributed free to retail stores in the US that sell needlework. Print subscriptions are available to others related to the industry in the United States for $14 for 6 issues; in Canada for $20 for 6 issues; other countries $43 for 6 issues. Online subscriptions are free. Sorry, subscriptions are not available to consumers. If you are a retail needlework store and are not receiving the Needlework Retailer please use our Manage Subscription page or call us at 800-561-5380 to subscribe.